Many still have no Nexus devices installed in our last update 4.4.1 KitKat when Google surprised us with a new update. 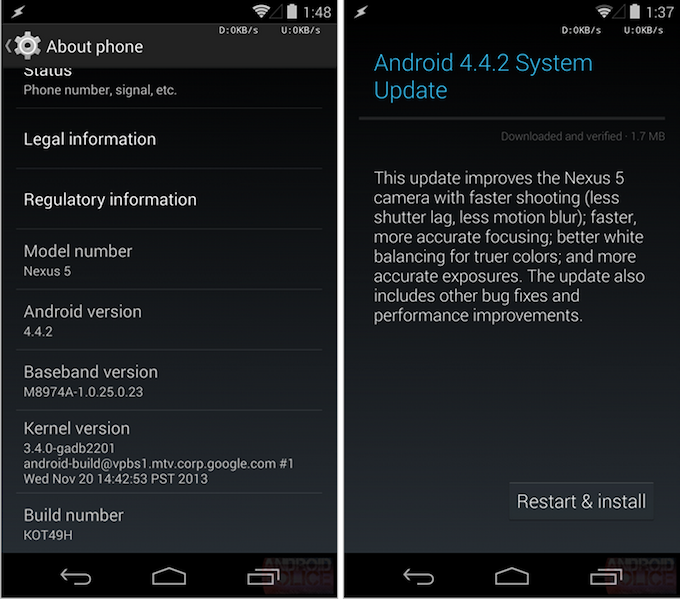 OTA Android 4.4.2 is now available for download. ‘ll leave the download links for the various Nexus that are already compatible with the latest version of Android. The two terminals Nexus, the Nexus Two versions of the model in July 2013, the Nexus model in July 2012 and finally also a compatible update to Nexus 10. An update in the making for those terminals that have the approval of Google and available for everyone. Those who learn to use adb commands and want to install the OTA can do so through the following links. Among the new features we’ve seen in this update, a new way for notifications of downloads, long to activate certain settings beats fast, a couple of new sounds, several bug fixes as uploading files from Chrome and safety improvements . latter is perhaps precisely what has driven this update, remember the serious failure in SMS that arose out of KitKat. It’s amazing the pace of updates that Google has decided to give a KitKat . Less than a year ago we were still in 4.2.2, and have now jumped almost hit the 4.4 to 4.4.2. From Mountain View seem determined to fix all the little glitches that may arise along the way. Who had not had time to upgrade to 4.4.1? Who has not caught him by surprise?